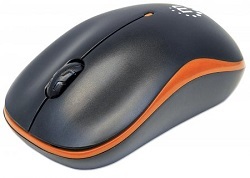 The Manhattan Success Wireless Optical Mouse combines modern design with advanced precision and performance. Its full-sized shape and three-button configuration provide direct access to essential commands with minimal wrist movement. A non-slip texture applied to critical surfaces helps provide a secure, comfortable grip. The remarkably small yet powerful USB micro receiver with 2.4GHz technology provides an effective range of up to 10 m (33 ft.) and stores in a special on-board compartment or remains installed for true wireless convenience.